Hongyang Zhang, Curtin University, Project 1.1. Hongyang obtained his Bachelor and Master’s degree in Oil & Gas Storage and Transportation Engineering from the China University of Petroleum. He commenced his PhD with Curtin University in 2014 under Dr Masood Mostofi. He later joined DET CRC’s Coiled Tubing Drilling for Mineral Exploration Project, and worked on drilling hydraulics and mineral cuttings depths determination for RoXplorer®. 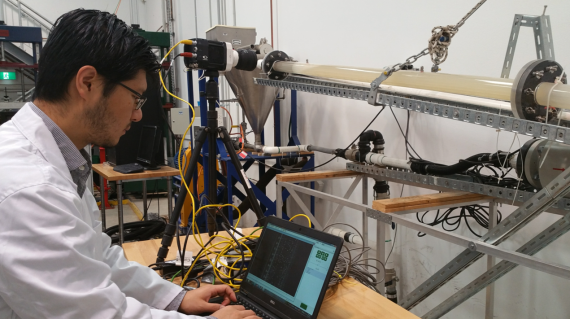 Hongyang’s assisted with the construction of the Flow Loop and the Particle Tracking Velocimetry system at Curtin University. He has conducted a series of field tests at the Brukunga DRTF including particle tracking, drilling fluid design and fluid loss prevention. In addition to using a high speed camera to measure cuttings… Hongyang is an avid photographer, and enjoys capturing moments in life behind the lens. He enjoys cooking, wine, and dreams of being a Michelin-starred chef someday.